One of the exhibit booths I visited at the recent World Tea Expo was Authentea. These were some of the nicest people I have met, so informative, attentive and who I believe truly love their product. Check out Authentea at their website here. Check out the USA website here. The below tea is described on their website as: An invigorating blend of fresh green tea balanced with a soft ginger note. Although I am showing the below tea as an example, they have a full range of green, black, oolong, herbal, iced and fruit teas. They are convenient to use in the car, at home, in the office, on a plane, at school or on the run. I received quite a few sample packets at the World Tea Expo of Authentea and I shared most of them with my co-workers. They all loved them. The favorite so far has been the Peach tea. They have been taste tested as iced tea and hot tea. Both received rave reviews. They are perfect for mixing in a water bottle on the go or at your office desk. They were definitely a hit! Authentea Pure Tea extract, is a brand-new high-end tea with unmatched characteristics. It is tea essence concentrate crystal by unique bio-engineering extraction, full of nutrition essences without any dregs. With raw material of well-selected tea leaves grown in high mountains, based on biological cell nano low-temperature extraction technology, tea beneficial substances such as tea polyphenols, tea polysaccharide, L-theanine and vitamins etc. are extracted and harmful components like pesticide and heavy metal residues have been removed. After multi-stage filtrations, tea essences are finally crystallized during low-temperature process. Small is premium. 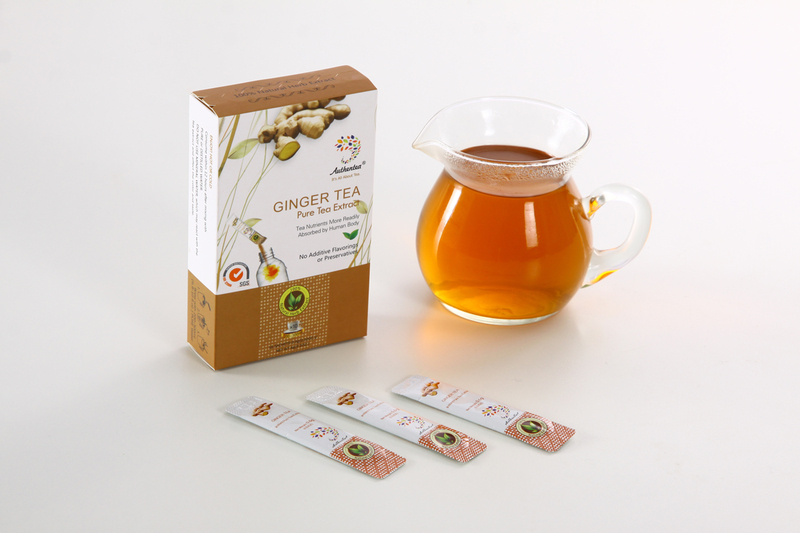 Each sachet of Authentea Pure Tea Extract contains only 0.6g. The sachet is small? 0.6 g is less? Yes, it is truly small. Essence is always small. Tea crystal of pure tea extract speaks the same truth. 0.6g of tea crystal, with full content of tea essences without even a particle of additive or waste, can go for a 200-300ml nice healthy tea drink. Enjoy the essence of premium tea in every sip! Check out their website for all the details. All I can say is that I love the convenience, the fact that they are pesticide free, the taste and the packaging!! At this time I am not sure how to purchase the Authentea in the USA, but if I find out I will surely let you know. Thanks for sharing! I am going to try my oolong this afternoon!